Thomas is in his first year of graduate school at McGill University in Montreal, Canada. His intention is to develop green chemistry methodologies and materials bringing them to industry. Working with industry we can modify, replace, or even eliminate the practices currently being used that are detrimental to the planet and its inhabitants. The focus of his work is on biopolymers as renewable materials and frameworks of functional materials. He is also a singer-songwriter, a boxer, and an avid student of the human body’s form and function. Chris is a senior at Saint Edward’s University in Austin, Texas, studying biochemistry with a minor in mathematics. He has conducted research at the Stanford Linear Accelerator Center (SLAC) National Laboratory through the Department of Energy’s Science Undergraduate Laboratory Internship program, investigating perovskite thin-film solar cells. He also spent a summer interning at the NASA Marshall Space Flight Center researching the use of aerogels as catalytic supports for carbon dioxide reduction. He is passionate about renewable energy and plans to pursue a research career in physical chemistry and materials science. In his spare time, Chris enjoys running, playing music, trying new foods, and traveling. Jill is currently a graduate student at the University of Idaho pursuing a master’s degree in environmental science focusing her research on climate change and social-ecological connections. Prior to graduate school Jill served as a Peace Corps Volunteer in Panama from 2012-2014. She has a Bachelor of Science in environmental science from Stockton University in New Jersey, where she was a three season athlete, competing in cross country, indoor and outdoor track. Jill has interned for three environmental nonprofit organizations including the Brandywine Valley Association in Pennsylvania, Riverbend Environmental Education Center in Pennsylvania, and River Bend Nature Center in Minnesota. She also spent a summer interning as an interpretive ranger at Glacier National Park in Montana. All of these experiences working for environmental organizations have instilled in Jill a passion for protecting people and the environment from the impacts of climate change. When not attending class, studying, working on her research or teaching Environmental Science 101 lab, Jill can be found running, practicing yoga and going on outdoor adventures. Greg is a senior at Grinnell College in Grinnell, Iowa, studying biology and french with the intention of going to medical school. He has experience working as an undergraduate, ecology researcher at Grinnell College and has worked as a student researcher at the Conquer Chiari lab at the University of Akron. In his free time, Greg runs cross country and track, watches Cleveland and Ohio State sports, volunteers on the Martin O’Malley presidential campaign, and makes rap music. Wilmarie is chemistry Ph.D. candidate at Texas A&M University. 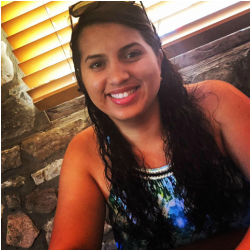 She was born and raised in the tropical island of Puerto Rico and has a bachelor’s degree in chemistry and environmental science from the University of Puerto Rico, Rio Piedras Campus. Wilmarie has been doing atmospheric chemistry research since her sophomore year, including two summer internships sponsored by NSF REU. Currently, she is studying the physical and chemical properties of atmospheric aerosols and their environmental implications. She is also involved in multiple organizations to encourage underrepresented minorities to follow a scientific research career. In her spare time, she enjoys dancing, traveling, listening to music, watching sports and spending time with friends. Prakriti, a native of Nepal, is a senior Biology major at Grinnell College in Iowa. She has spent past two summers conducting research on Lupus genetics at the Mayo Clinic and intends to attend medical school in the near future. Her previous experiences with various non-profit organizations in Nepal such as Aarogya Foundation, Himalayan Healthcare, and CWIN have deepened her interest in learning about the steps being taken to combat the effects of climate change on human health, especially in the developing world. In her free time, Prakriti enjoys playing tennis, dancing and is an avid foodie. Gilbert is a senior Forensic chemistry major at York College in Pennsylvania. He works as a lab assistant for general chemistry and in lab preparation. He worked as an intern in the summer of 2015 at Shimadzu Scientific Instruments, Inc., where some of his projects included an environmental focus on water analysis. He has been a member of the YCP Chemistry Society since his freshman year and is currently the president. After finishing his studies at YCP, he is looking to enter a Ph.D. program in analytical chemistry. Gilbert is excited to learn more about climate change and helping other students become more exposed to the issues being discussed at the meeting. In his free time, he enjoys surfing, snowboarding, and swimming. Nina Diklich is a senior at Aquinas College in Michigan studying chemistry with a minor in mathematics. She previously was an ACS student delegate to the UN Climate Talks in Lima, Peru in 2014, and this year she will be serving as the student mentor for COP21 in Paris, France. In the summer of 2015, she participated in an NSF REU at the Nanoscience and Nanotechnology Institute at the University of Iowa studying the impact of engineered nanomaterials on humans and the environment. She also has been a chemistry intern for four years with AptarGroup, Inc., the world’s leader in dispensing system solutions. This direct contact with the aerosol industry was the inspiration for her involvement with environmental protection and education. Her passion and interest is the intersection of climate change and health as well as the role of environmental accountability within international business. In her spare time, Nina can be found reading, running, socializing with friends, or at her on-campus jobs as a teaching assistant and tutor.